My wife, daughter and I happened upon these four girls splitting a four pound “Whitman’s Sampler” at the mall. 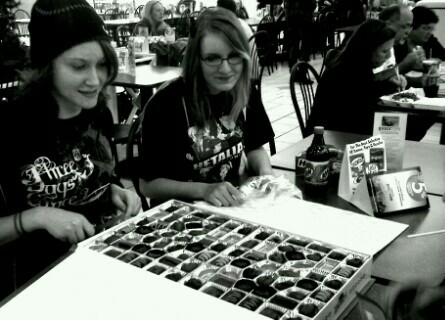 They were sitting in the food court with the box open, splitting the chocolates. We asked to take their picture and what the story was. They simply said, “You can buy one at Sear’s for 20 bucks. We pooled our money.” These girls were living. Of course my wife thought they were having boy troubles or celebrating something but no, they were just living. How many of us would spend 20 busks to share a 4 pound box of chocolates “just because?” This was making memories and living it up! “Do you remember that time we were splitting that monster box of chocolates and that guy asked us to take our picture? Like the street photography feel. Great post.